Jimmy Hollywood begins on a wonderfully wistful note with Jimmy Alto, a down-on-his-luck actor, strolling down Hollywood Boulevard with his loyal but mentally off-key buddy, William (Christian Slater). With his eyes closed, Jimmy accurately names the stars whose slabs he is walking over, and the glamour of old-style Hollywood that the names conjure up are at painful odds with the seedy street life that surrounds them. Hollywood Boulevard has become the domain of pimps and their hookers, of crippled beggars and street gangs but, to Jimmy, Hollywood still means Bogart and Bacall, Cagney and Eddie G.
Barry Levinson used to be quite a name in Hollywood, but it looks like his best was already behind him when he made this comedy, his first movie after the big-budget disappointment of Toys (1992). Jimmy Hollywood starts off strong and holds its own for the first hour or so, but as the vigilante element to the story takes centre-stage the initially likeable characters of Jimmy, William and Lorraine quickly begin to lose focus as they start to react to the events on screen instead of driving them. It’s a shame, because early on you really get a sense of Jimmy’s love of Hollywood and his desire to achieve the kind of fame enjoyed by his celluloid heroes. Of course, the glamour he yearns for is as illusory as the security he attempts to obtain through the actions of his vigilante persona. As his exploits become more dangerous – he engages in a gunfight with a couple of street hoods who try to take the video camera with which he and William are filming them, and then abducts a drug pusher – his character becomes increasingly removed from the sweet guy we first met and more of a comic cipher with no real personality to speak of. 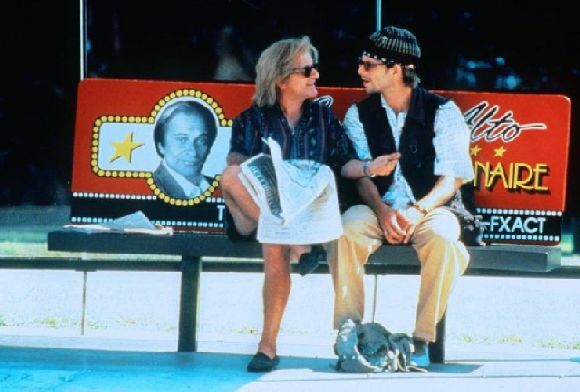 Pesci dominates the picture as Jimmy Hollywood – even though it’s Christian Slater who gives the better performance – which is something of a drawback as he isn’t really cut out to carry a comedy movie. His comic talents are limited – even when playing opposite the likes of Mel Gibson and Danny Glover in the Lethal Weapon movies – and he comes off as more irritating than funny when the weight of a comedy movie falls upon his shoulders. In fact, Pesci’s wig is funnier than he is. This might be a joke based on the fact that his on-screen girlfriend is a hairdresser, but if not, you’d think an industry that can convincingly create intergalactic worlds and then destroy them in eye-popping 3D could come up with a syrup that doesn’t look like it belongs on an Afghan hound rather than a man. Overall, Jimmy Hollywood has to be considered a failure, but it’s not without its moments. Levinson displays some visual flair, and the screenplay throws up the occasionally insightful line – Jimmy’s melancholic observation, for example, that things have deteriorated so much that it’s now the innocent who live behind bars. The wistful nature of Slater’s damaged William is also quite affecting, making him an inherently likeable character, and his relationship with Jimmy is well-drawn. However, it’s something of an indictment of a movie when it’s highlight comes courtesy of a high-profile cameo during its end-credits sequence.